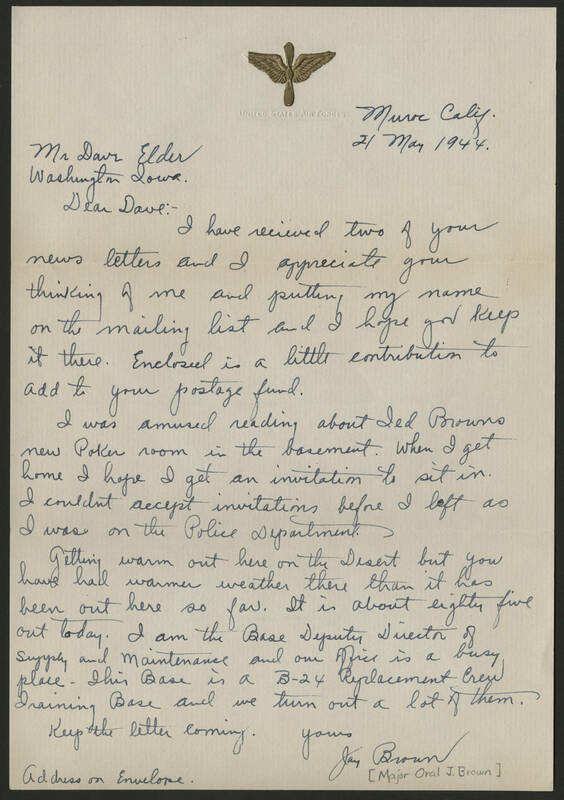 Muroc, Calif. 21 May 1944 Mr. Dave Elder Washington Iowa Dear Dave: I have received two of your news letters and I appreciate your thinking of me and putting my name on the mailing list and I hope you keep it there. Enclosed is a little contribution to add to your postage fund. I was amused reading about Ted Browns new Poker room in the basement. When I get home I hope I get an invitation to sit in. I couldn't accept invitations before I left as I was on the Police Department. Getting warm out here on the desert but you have had warmer weather there than it has been out here so far. It is about eighty five out today. I am the Base Deputy Director of Supply and Maintenance and our office is a busy place. This base is a B-24 Replacement Crew Training Base and we turn out a lot of them. Keep the letter coming. Yours, Jay Brown [Major Oral J. Brown] Address on envelope.